[AUTO]:When this unit is placed on (VC) or (RC), if you have an «Oracle Think Tank» vanguard, each player may draw a card. I honestly don’t know how to feel about this card. Granted, it has a clone of itself in another clan (Myrtoa in Bermuda Triangles), and it’s always nice to draw a few extra cards here and there, but the fact that it can potentially give your opponent a 10000 shield or even a Sentinel can be pretty risky whether it’s for your Oracle Think Tank deck for Dark Cat or in your Bermuda Triangles in Myrtoa. It’s 7000 power is very nice also, so at least there’s a nice plus to giving your opponent an extra card as it makes a very nice booster. I know most Oracle Think Tank players like using this, but most of the players I know that play this clan actually try using other cards as they don’t like the option of helping the opponent. I know this one is short compared to my other COTD reports, but the thing is that there really isn’t much to say about this card. It’s a decent card with nice stats, but the fact that it helps the opponent as well is where it lacks a higher rating. Dark Cat is one of those cards that is the major selling point of a trial deck; even more so than the cover card. Drop this 7k grade 1 on the board and both players can draw a card. The draw is optional, I should mention, but I can’t imagine why you wouldn’t draw (maybe you only have two cards left in your deck?). This card, being 1k larger, all but usurped Battle Sister Cocoa’s position in Tsukuyomi decks, drawing the card and getting closer to the stack rather than just putting the top card at the bottom of the deck. But the benefits don’t stop there. In Sakuya decks, Sakuya can bounce the cat and let you play it again for an extra draw. Extra draw power in OTT is really good for digging for those Silent Toms, and sticking it behind a Tom makes a 15k column, which can threaten 10k vanguards. OTT is all about hand advantage. Dark Cat embodies that principle nicely, and makes a decent booster at the same time. Rating: 5/5 – Works in every OTT strategy. When this card first came out on the Japanese side of things, it was welcomed with open arms, not necessarily for anything it did, but for a more simple reason - its 7000 power. Before Dark Cat, Oracle Think Tank as a clan was sadly lacking in 7000 power boosters, the only option being the promo-only Circle Magus, who also did even less than Dark Cat. With Dark Cat, Oracle players finally had an accessible decent booster outside of Gemini, their vanilla unit. Then set 3 came out with the grade 1 Tsukuyomi, who was at 7000 power, but Dark Cat continued to be seen as a good choice since it didn't require you to use the Tsukuyomi chain and it wasn't Circle Magus. The thing about this little history lesson, though, is that not much has changed since then. All of the 7000 power boosters that Oracle Think Tank has received (Omelet, LaLa, Sayorihime) have been tailored for specific decks and never just utility cards like Dark Cat. 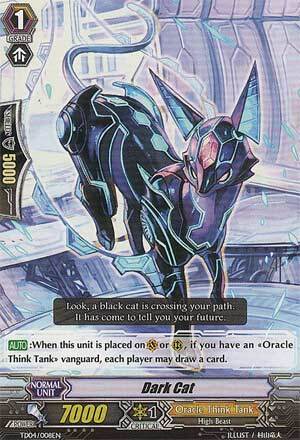 As such, Dark Cat has held its place as the good booster one goes for when building any given Oracle Think Tank deck. That is all really unfortunate, though, because her ability isn't all that great. It allows both players to draw a card, essentially a one-for-one, but instead of simplifying the game like other commonly used one-for-ones like Kimnara and Amon, it complicates it. This has ups and downs. The ups are pretty specific to the clan, and whether or not you really want to use Dark Cat rides pretty heavily on these. First, giving yourself a card allows you to defend for longer, extending the game, which is good for decks that thrive on long games so that they can abuse their incredibly strong late game. In case you can't tell, I'm talking about Tsukuyomi - other decks, like CoCo and Battle Sisters, don't need the game to go on for so long. Second, using it early can make it a tiny, tiny bit easier to dig through your deck for the grade you might need to avoid being stuck. Once again, this is only really a boon in the very popular variant of Tsukuyomi that only runs four copies of the grade 3 Tsukuyomi as their grade 3 lineup - other decks really shouldn't need this. The third and final benefit is that using it in early game might help your field development accelerate. The downsides are pretty much the upsides in reverse, funny enough. Unless you specifically want the game to last a long time, giving your opponent another card to defend with only makes it so Dark Cat doesn't do much for you at all - in fact, it might hurt you by giving your opponent more to choose from, and options are power. I've seen it said many times that Dark Cat's ability gets evened out if you get an extra attack off that turn because of the draw, but even then it's still really only a one-for-one, because the "extra card" the opponent would have had to use to defend was given to them by you. In addition, it isn't really a matter of who gets to use the card they gained first, because in Vanguard that doesn't really apply - as soon as you draw a card, even on your opponent's turn you have the ability to use it by defending; in fact, the ability to have more options to choose from when deciding what to guard with can only make your future turns and your field development better, not worse, so you still aren't hindering your opponent in any way. You are only aiding them in acquiring what they need to succeed later in the game. That all said, Dark Cat still has its uses as it always has had since its release, and it will continue to be used as long as Oracle Think Tank continues to lack decent generic 7000 power boosters.